This has got to be the most beautiful time of the year for me. Frosty mornings, crisp clear evenings, but it certainly is more likely to have you crave something heartier for dinner. I was in a similar position this past weekend. after a clear but cool autumn day I found myself walking through the aisles at Fresh Choice, Nelson… And there, as if it was meant to be, was exactly what I never knew I wanted yet… Some nicely portioned pieces of free range pork belly. Just the right thing to see me through that cool winter evening, not to mention to keep the kitchen smelling warm and cosy. It does pay to be a bit choosy when buying pork belly, the difference between a good piece and one that is overly fatty is usually easy to tell by looking. Look for plenty of meat with not too many fatty layers. Preheat oven to 240 degrees C. Dry the meat well and season with salt/pepper. Sprinkle the sage leaves on the bottom of a metal baking dish (not glass or ceramic) and place the pork on top, skin side up. Season the top with the remaining salt and a little rub of olive oil. Roast for 20 – 30 minutes at 240 degrees C until the skin is starting to blister and crackle. Watch closely for burning. Add the garlic and pour the milk around the meat to come about half to two thirds of the way up the sides of the pork. Reduce the temperature down to 160 degrees C and roast for a further 1 1/2 hours or until the meat is tender. Check the level of liquid during cooking and if it has evaporated, top it up. 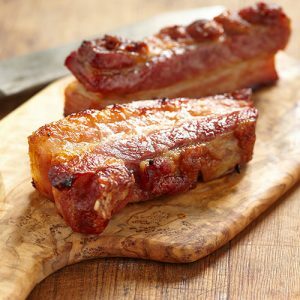 When cooked, remove it from the oven and remove the pork from the liquid straight away, rest for a few minutes, cut it into portions and serve. Cutting tip: Place the meat flesh side up on a chopping board and use a heavy, sharp knife to slice into strips about 3-4 cm thick. Do this quickly and return it to skin side up so as not to soften the crackling.